5. Arrive at your CSA pickup location and pick up your customized CSA share. Celebrate and enjoy! Each week, our CSA members are given the opportunity to customize the items in their CSA share based on what is available that week. If you simply do not want radishes or maybe have an upcoming event you are planning and want several bunches of carrots, our CSA program is perfect for you. There are add-on items that will be available for you to select at sign up. Seminary Hill Farm is proud to partner with local chicken, beef, lamb and pork producers within the region of Central Ohio and offer a Protein Share to our CSA members to add on to their CSA share. The Protein Share is distributed bi-weekly and is available in full and half protein share size. For more information about the Protein Share and the farms we work with, please click here. You can also choose to add the egg share or the bread share to your weekly subscription. If you select the egg share, you will receive a dozen pasture-raised eggs that are from the chickens at Seminary Hill Farm. If you select the bread share, you will receive freshly baked, artisan bread created by the professional baker at Seminary Hill Farm Kitchen, Sarah Black. For more details about what our bread share offers, please click here. Both of these items are of high-quality and will complete your experience with our CSA program. At sign up, you will have the option to pay in full or subscribe to weekly payments. Select the choice that works best for you and then the system we have chosen handle the rest. We want our CSA program to be enjoyable and convenient for our members. 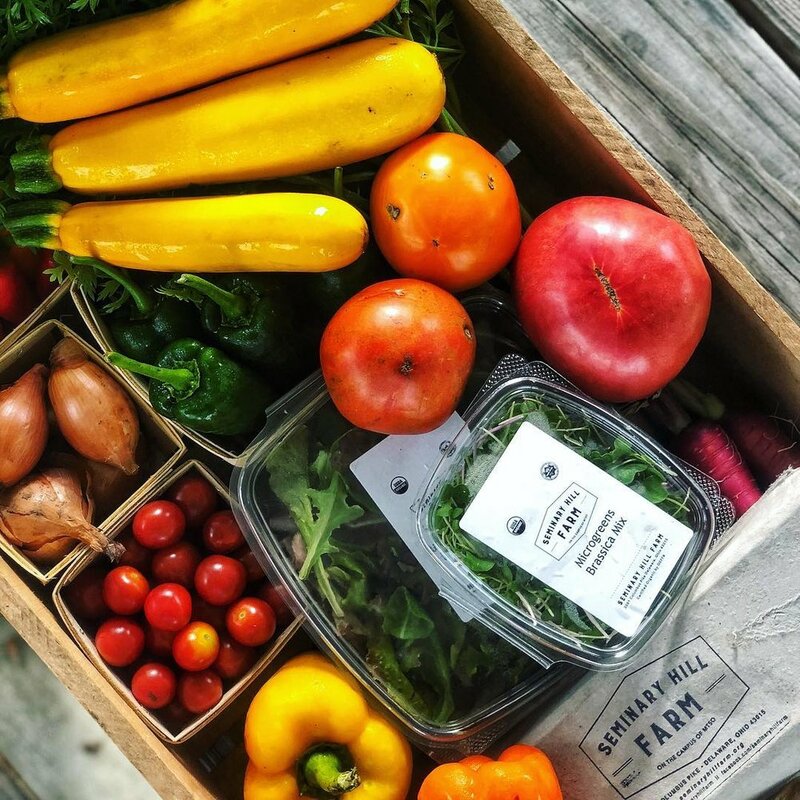 Whether you have a vacation planned or simply have too many activities planned that week, you can easily place your CSA subscription on hold or change your pick up locations to make CSA distribution more convenient. Each week of the CSA season, you will have access to recipe suggestions, cooking tips, storage, and food prep resources for each of the items in your CSA share. Our team is excited about each of the varieties we have planned this year and cannot wait to see how the amazing dishes our members create. For members of the metropolitan area of Columbus, Ohio, the summer season is filled with hot, sticky days and warm summer nights. Seminary Hill Farm embraces this change in weather because it provides an opportunity for cultivating different varieties that thrive in the heat. From tart tomatillos to sweet sugar baby watermelons, the Summer CSA program delivers fresh flavor with a quality that goes unmatched. Our market farm uses hand managed spaces to cultivate and harvest the food grown in our fields. When you join the Summer CSA program, you can expect to receive quality ingredients to enjoy and prepare every week of the summer season. There are three different CSA share sizes to choose from during the Summer season. You can also choose to add any of the following options to your CSA share. For more detailed information about the protein share and the talented farms we work with, please visit our Protein Share page. Each week of the Spring CSA season, members who sign up for the Bread Share will receive a freshly baked loaf of bread crafted by Seminary Hill Farm Kitchen’s professional baker, Sarah Black. She is an incredible talent that will change the way you think about all things bread. Each week, CSA members who sign up for the egg share will receive a dozen eggs from the pasture-raised chickens at Seminary Hill Farm. Our “ladies” are free to roam on open pasture and forage on plants and legumes. This is diet produces a gorgeous golden yolk that is full of both flavor and nutrients. We offer many different pick up locations and distribution times throughout the metro area of Columbus, Ohio. For the complete details of all our current CSA pickup locations for the Summer season, please click the button below.